I did consider this angle you argue for here myself, but I figured the suppression of lipolysis over a 24/h period would likely mitigate the expected depression of insulin in response to glucose. 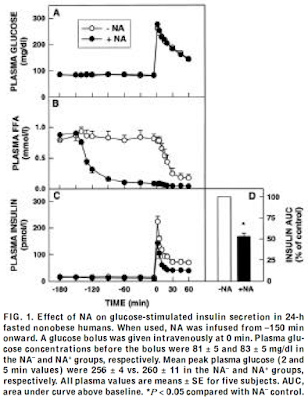 In this case, the lower insulin in response to glucose is a direct result of impaired lipolysis, and mimics the type observed in adipocytes that are more insulin sensitive (therefore, easy to fatten) due to lower lipolysis. I would expect insulin depression to be proportionate to disability utilizing fat from fat tissue. Of course its also true antinflammatory effects of the drug are insulin suppressive (improved sensitivity whole body) greater than that which is produced from lipolysis impairment. It seems acipimox is actually different from nicotinic acid, the latter produces elevated insulin levels and IR with high dose use, acipimox does not interestingly enough. Acipimox targets certain nicotinic acid receptors, whereas niacin likely has other physiologic effects that promote this dysmetabolic state. In my blog I speculate one mechanism may be increased 5ht in the brain which is antidopaminergic, and potentially contributing to hyperglycemia/hyperinsulinemia (similar to SSRI drugs). Lower dose niacin may just lead to depression of insulin/glucose secondary to depression of FFA. It is for this reason i speculate weight neutral profile is possibly elicit through inflammation lowering and reduced triglyceride, and possibly a more central origin. Gemfibrozil reducing weight, being effective to lower TG, meanwhile acipimox being weight neutral, while also reducing triglyceride effectively, is an argument the antilipolytic effect of this drug is independently weight gain promoting. The sum of the drug effect leads to weight neutrality. In either event, one of the most potent fattening drugs is insulin itself, you think they would kind of CARE about that when analyzing "evidence for the insulin hypothesis". The pocket response "urine glucose loss/hypoglycemia" is effectively defeated by the glargine vs detemir fattening discrepancy, which you pointed out in that excellent blog. Pts with insulinoma typically become hugely fat in spite of no diabetes (urine glucose losses). So that leaves hypoglycemia as the primary potential fattening mechanism, and glargine remains much more fattening than detemir in spite of equal hypoglycemia risk. Bias leads to a very selective and uneven "review of evidence". Yes Wooo, and I clearly have my own biases which are towards working at the peripheral nuts and bolts basis of adipocytes and beta cells. I have absolutely no doubt that higher level signalling in the brain is important and will recapitulate and fine tune the effects in the periphery. You deal with these upper layers far better than I ever will. But no one with half a gram of sense would expect the central controls to do the opposite to peripheral basic mechanisms. They should be congruent. I love your link to the glucose and/or insulin clamp paper and appetite. So elegant. So relevant to central insulin action. Question: How do you get a physiologically appropriate concentration of insulin in to the brain to study CNS insulin action? Answer: Infuse a physiological level peripherally. A needle in the brain is for pathology. Mostly. Hi Peter, nice one! Putting more weight on acipimox results (pardon the pun) than on results with insulin to test the CIH is absurd. However, I don't quite yet understand enough about acipimox to comment on it. Carb-based diets promote increased conversion of palmitic acid (C16:0) to stearic acid (18:0) and oleic acid (18:1). So carb-based diets increase chain elongation and some SFA into MUFA, the latter being proportionally more stimulating of insulin. Is this a bug or a feature in people eating a carb-based diet but devoid of the worst carbs (flour and sodas), opting for legumes, potatoes and fruit instead? raphi, MUFA are less insulin stimulating than saturated fats, they are produced, as you say, under elevated insulin conditions. 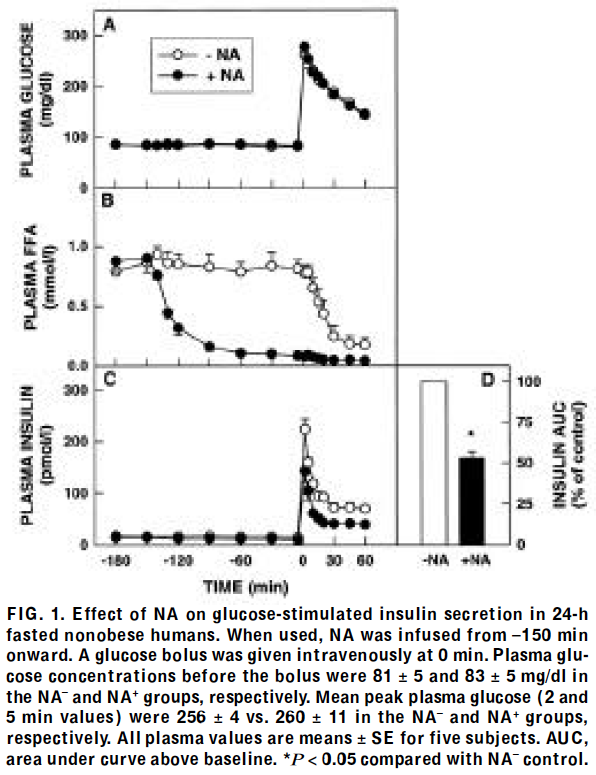 They decrease insulin secretion BUT they also facilitate insulin signalling at peak insulin concentrations (so facilitate weight gain) in the periphery. They are carb-friendly long chain fatty acids. Saturated fats promote more insulin secretion but decrease its action at peak levels in the periphery. They are fat metabolism friendly FFAs. Without PUFA there is a balance between sats and MUFA depending on the starch to fat ratio, fed to fasting state. Thanks for correcting and clarifying that for me. "Saturated fats promote more insulin secretion but decrease its action at peak levels in the periphery. They are fat metabolism friendly FFAs." This reminded me of the pancreas discussion in the Protons thread, so I went back and re-read it. The idea was that reducing the CoQ couple and triggering RET in the pancreatic beta cell mitochondrial ETCs was the signal for insulin secretion in contrast to insulin resistance in muscle and fat cells. So, this explains the "teeter-totter" or amplitude effect of MUFA vs SFA on insulin signalling. What increases sensitivity reduces secretion, and what decreases sensitivity increases secretion. I assume we're talking slight differences vs carbohydrate. Still, it seems like there might be knock-on effects, such as on insulin as an anabolic hormone and insulin's impact on mTor. Unless I'm crazy to think this way, any idea what these knock-on effects might be?